On July 14th, Kelly and I headed to New Hampshire to join other family members at my sister’s place for a big family meal. 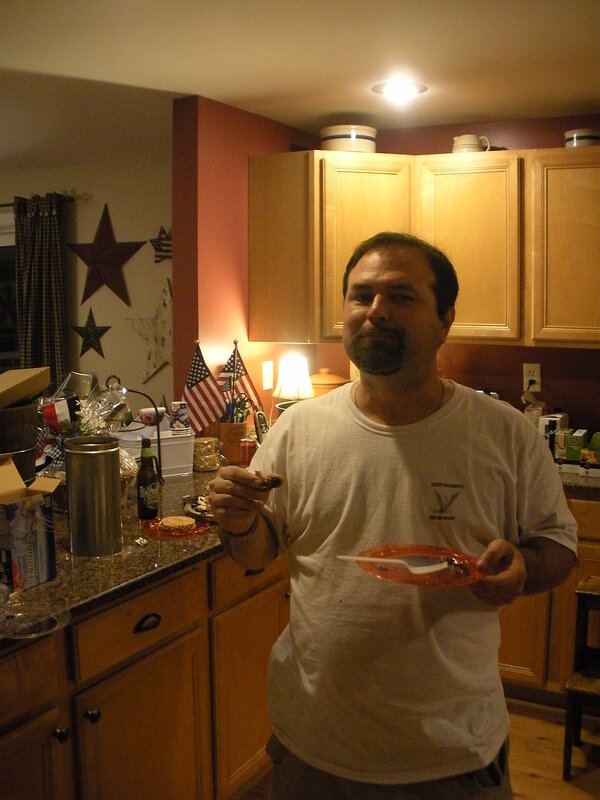 And since I got to do a lot of the cooking, I had a grand old time. 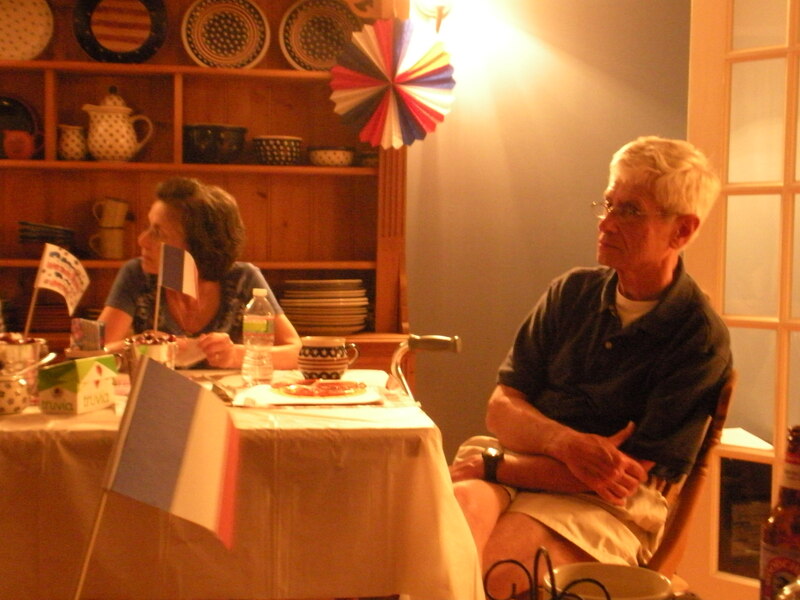 Since my sister had chosen to “theme” the party as a Bastille Day celebration, naturally the geek in me thought of the song by Rush. It took some concentration to not have the song go through my head all day. But anyway, we got there a little later than many of the others, since I had to work earlier in the day doing a walking tour in Beacon Hill. But then I had to get right to work doing some of the cooking and helping my sister, who had never done a clam boil before. My dad had helpfully given her a lot of tips, and so generally she had things under control, although since she had never actually done any of the “testing”* [footnote not for the squishy of heart] of the steamers (that’s softshell clams for you non-New Englanders) clams she did not know how to do it. So despite the French theme and decorations, the food was very Portuguese. Mom and Dad amidst all the decor. My sister Liz really went all out. In addition to my sister, her husband Dan, and their three kids, my Aunt Pauline and Uncle Paul came over from Chelmsford, my cousin Claudette came over from Granby with her three girls, and my cousin John came from Tyngsboro with his wife Mary and their daughter. All the girls really get along great. I love the fact that they all became friends at our wedding. 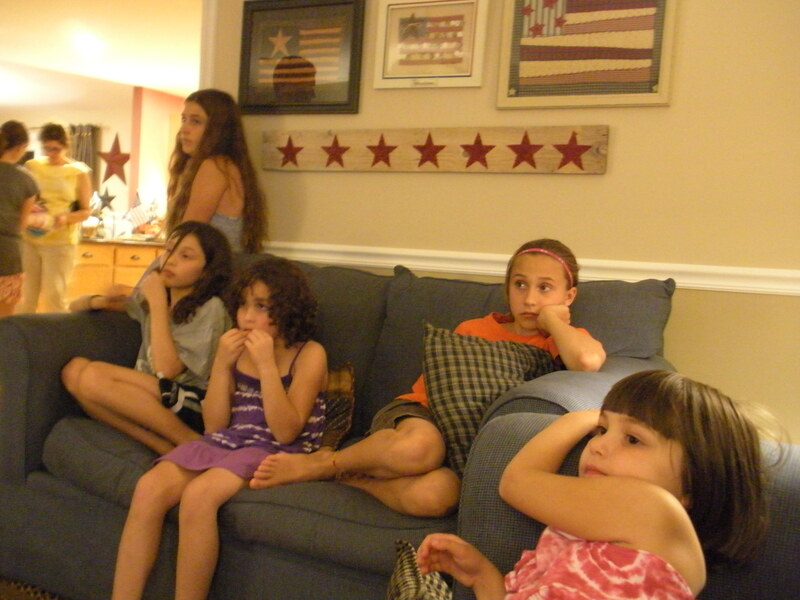 All five girls watching something intently. I have no idea what. Kelly and I also decided to bring one of our wedding gifts that we had not yet used: our magnificent White Mountain ice cream maker. I like the idea that a company that made ice cream makers before the Civil War is still around. And guess what? It turns out the ice cream it makes is pretty good. I can hardly wait to try making some homemade coffee flavors. Maybe something with coffee ice cream and Reese’s cups or something. Anyway, there were a variety of desserts, and I tried them all. Look at this doofus, stuffing his face full of sweets. 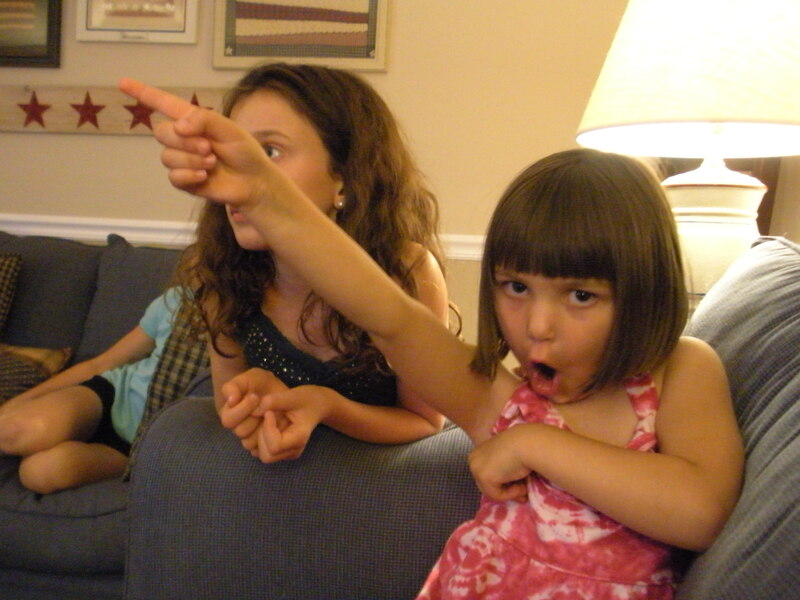 Note the shifty eye, the “hand caught in the cookie jar” expression. Clearly, this man should not be trusted alone around delicious desserts. 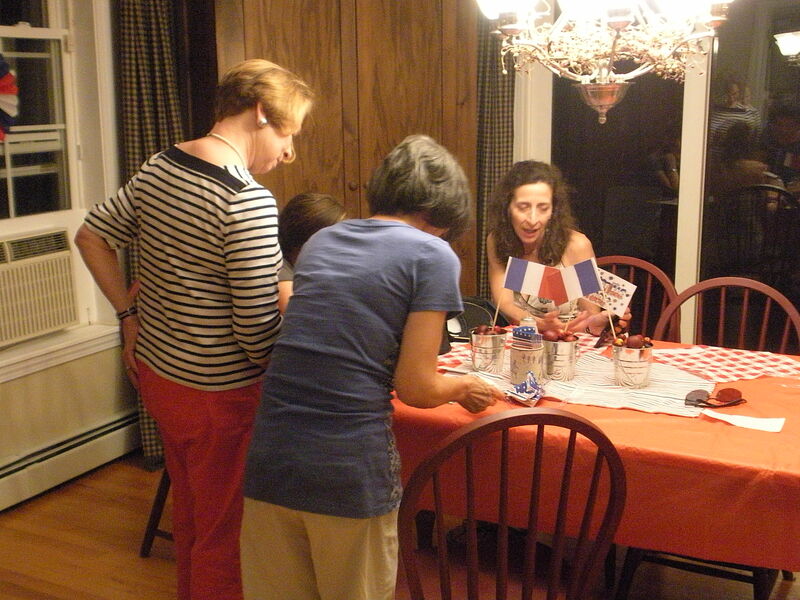 My sister even managed to come up with a bunch of activities for all of us to do, including some French history trivia. Guess who tied for first with 22 of 25 questions correct? That would be us. History geeks extraordinaire, mon amis. Aunt Pauline, Liz, mom, and my cousin Claudette work on their trivia questions. The dinner came out great, and we all had a good time. The kids seemed to be having a pretty good time too. I’m not really sure how little Kate got exposed to the seventies, but I can assure you, it was not me or Kelly. *You have to make sure the clams are still live before they are cooked. Usually I will rinse them off a bit, poke them with a shellfish knife or something, and see if they react by closing their shell. If they react, they are good to go. If not, in the trash they go.